USU Eastern Cosmetology students spent Saturday, March 23, treating the spouses of the 624th FRG National Guard Unit to a special spa day. Their husbands were deployed on June 13, 2012, and scheduled to return the end of April 2013. 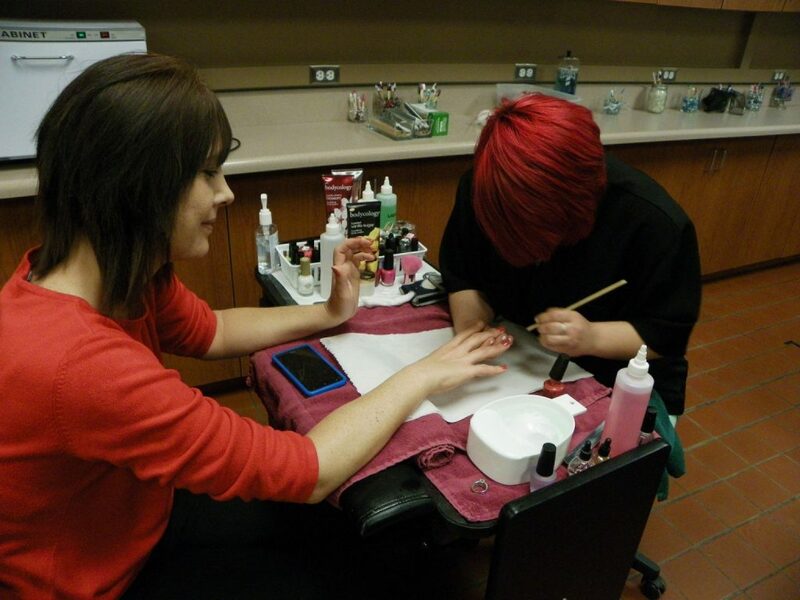 According to Jessica Keller, instructor, students gave manicures, pedicures and paraffin wax treatments to all the women plus certificates to return for a hair cut during the college’s regular work week. They also provided snacks and drinks to make the group’s experience special. Keller said it was inspiring to talk to the women whose husbands have been gone for almost 10 months. Babies were born, newborns reached their first birthdays while the older children had the hardest time missing their dads fighting in Afghanistan. They totally understand what is happening in their dad’s world. “I am so grateful for the selfless service their husbands give to protect our freedom. This [spa day] was a little event to provide service to the women. They have given up so much for the cost of freedom,” Keller said. The idea to “pamper” the wives came from Jennifer Tatton whose husband has been in the military 18 years. “We are a military family and we need to talk to others who are the same situation. It has been the hardest part of my life to be without my husband. The Price unit has 35 soldiers deployed and the married wives have joined the group for their monthly activities. If the soldier is single, his mother is invited to attend so they feel a part of our family, she added. She came up with the spa-day idea and talked to cosmetology instructor Debbie Prichard to ask if her ladies could get a discount on the school’s services. Prichard offered to have her students come in on a Saturday afternoon and provide the services free of charge. “Everyone appreciates what these wonderful men are doing for this country and the women they left behind,” she said.